I don't have any idea as to when Facebook (FB) will become obsolete because based on observation, the number of FB users grows rapidly each day. Even those who are below 18 years of age got an FB account (with fake birth year of course LOL!). My grade schooler nieces and nephew already had an account and even the four month old baby of my colleague got one too! Now, who can resist FB? As for me, I thank FB because it makes the world smaller, allowing me to get an update from my siblings abroad. In our office, we've got lot of things to do especially when we have projects on the line. Computer tasks are plenty but just like what the picture below says, FB is like a REAL TEMPTATION. And with approval, there goes my colleague who's always been updated with the latest happenings of his friends through FB! I am linking this post with Blog photo Challenge! Hahahaha! Kahit busy di pwedeng Hindi magfb e noh! 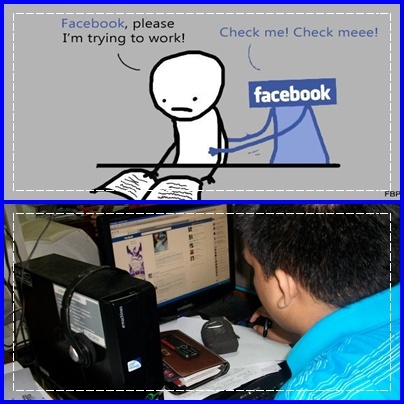 What I do is I close my FB tab when I'm finishing tasks coz its really tempting. And once you pop you can't stop! haha my kids have FB account too. I made them an account para lang sa games! haha.. thanks for joining BPC sis! we are not back in http://www.myphotomeme.com, hope u can join!